Independent travelling has become a lot easier nowadays with apps like booking.com. As the famous Lonely Planet saying goes, “good places go bad and bad placed close down”. It’s about time I write reviews on apps which I’ve used on my travels. 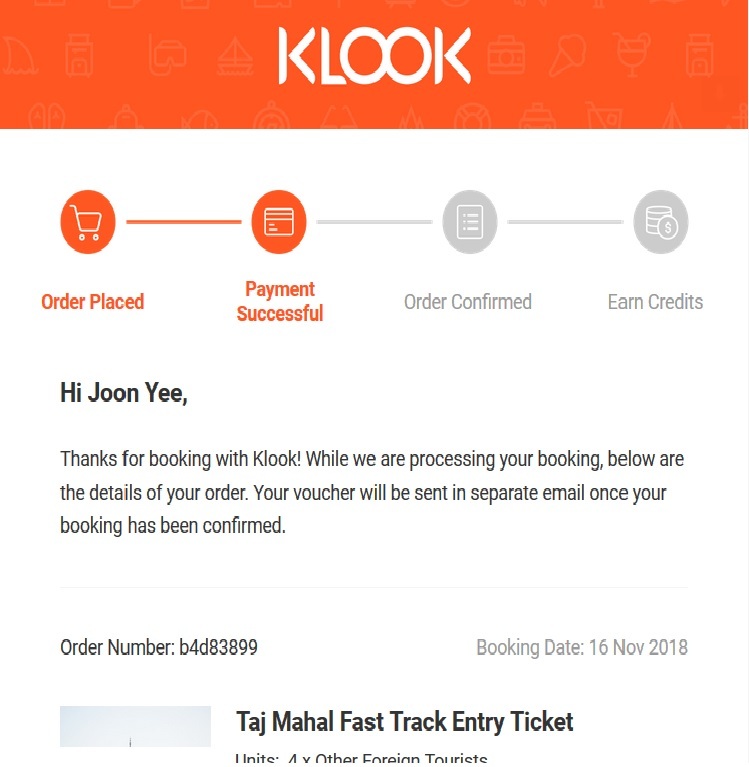 A couple of years ago when I was going to Taiwan, a friend of mine recommended Klook. As I had not heard about the company or read many good reviews, I hesitated to try them. End of 2018 and I’m going to India and I’ve heard horror stories about long queues and horrendous crowds at the Taj Mahal, so I decided to search around for a service that would give me and my family some priority at the entrance. 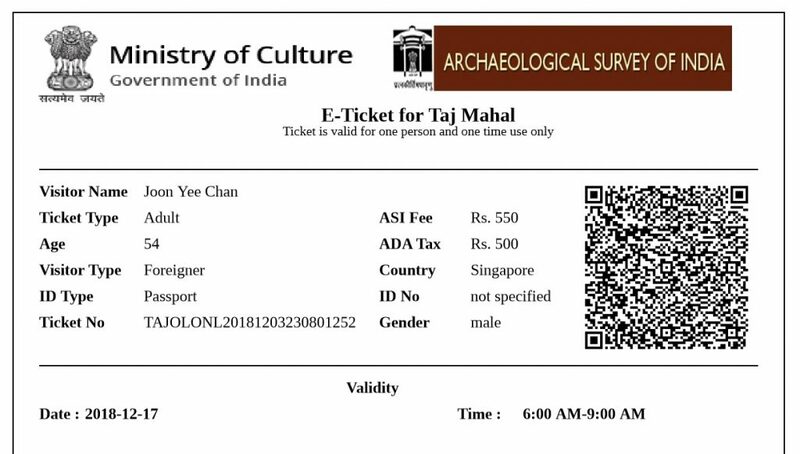 It didn’t take much googling before I stumbled upon Klook’s Taj Mahal Fast Track Entry Ticket. Regrettably, I only read the first few good reviews and the following information. Below is a screen capture of what it looks like on their site/app. For anyone booking the private tours from Delhi or Agra, the guide will arrange your entrance tickets beforehand on your behalf. I didn’t book the guide – just the fast track entry ticket and I expected the tickets in my email in 24 hours as mentioned. Below is a screen capture of the acknowledgement dated 17th November – which was about 1 month from my date of arrival in Agra. So far so good. A few days later, when I didn’t receive any tickets, I contacted their support and received the following reply. With regard to your booking HUZ093522, we sincerely apologize for the delay of confirming your booking. Please be informed that we have already sent a request to the relevant team to have this booking confirmed as soon as possible. Please do wait for at least 24 to 48 hours from today for your booking to be confirmed. If you still haven’t get the voucher within the said time frame, please do notify us. Any other questions, feel free to let us know. Happy to help with your travel plans. By 30th November, nearly two weeks from the time I ordered my tickets, I asked for an update and received another pretty useless reply. I hope you’re doing well. I am still checking with the local operator about your questions. I’ll keep you updated and let you know once I receive their response. Once again, I appreciate your patience. Then, I searched a little deeper into the service and discovered the horrifying review from another customer! I’m not sure if I should remain hopeful or just give up on them and demand for a refund. 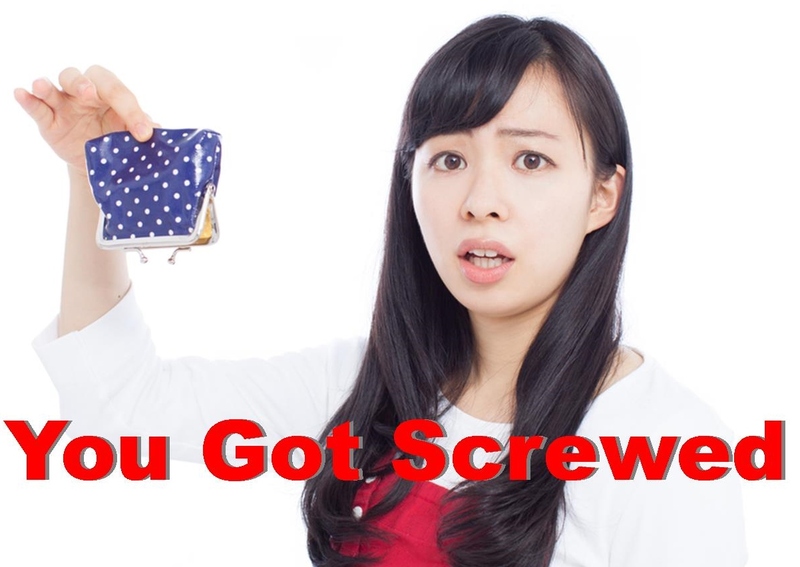 If the tickets never arrive or if they turn out to be useless, you (and they) will certainly hear about it. Please share this post and warn your friends. The e-ticket finally came, but we’re not out of the woods yet as they may not be valid as one of the reviewers said. I’ll try use it at the entrance and see if it works or not. Watch out for more updates from India. My 16-year-old’s ticket was processed as a child’s ticket. I thought he was still eligible, but the whole family was held back when we had to join the queue to get him the appropriate ticket. Suffice to say that it was a total waste of time and money. From what I observed at the East Gate on a normal weekday, the queue was quite manageable. Towards the late morning, there was hardly anybody going in. This “fast track” ticket is totally unnecessary. Do not bother. You’re just wasting your time and money.